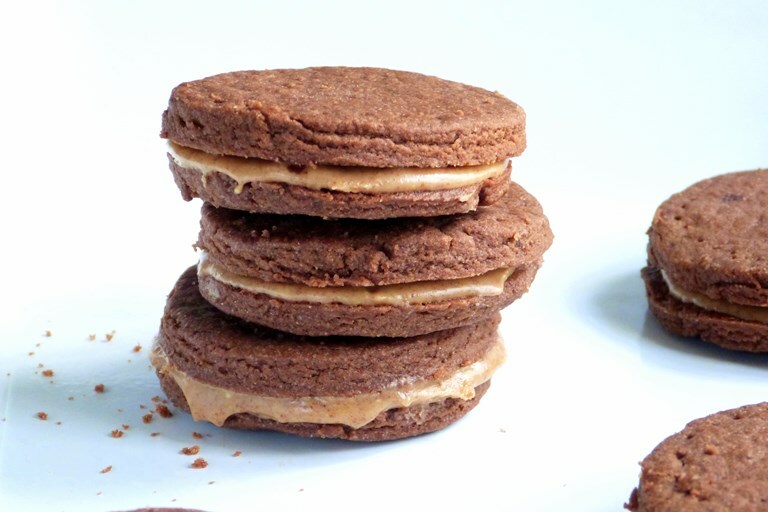 Rukmini Iyer celebrates the magic combination of peanut butter and chocolate in this peanut butter cookie recipe, sandwiching her beautifully crisp chocolate biscuits together with a sweet and salty peanut buttercream. Chocolate, salt and peanut butter are to my mind a far more interesting mix of salt and sweet than the ubiquitous salted caramel. Less sugary, with an intense savoury hit from the peanuts, they marry so well into a dessert that it’s hard to understand why the combination doesn’t crop up more often in confectionery here – unlike in the USA, where they’re well ahead of us with peanut butter cups and handsome jars of swirled peanut butter and chocolate (flavoured) spread. While these crisp, grown-up cocoa biscuits are a treat in themselves with a cup of tea, for a substantial biscuit that’ll see you through from 3pm till dinner time, possibly with a gym visit in between, try the salt laced peanut butter buttercream as a sandwich filling. Good quality cocoa in the biscuits will make all the difference – and if you’re feeling artistic, you can always try stamping out a small heart shape in the middle of each cookie half, to turn these into the dark and handsome cousin to the jammy dodger.